Providing a 20% increase in braking power as well as much improved heat dissipation compared to the standard XT M8000 brakeset. 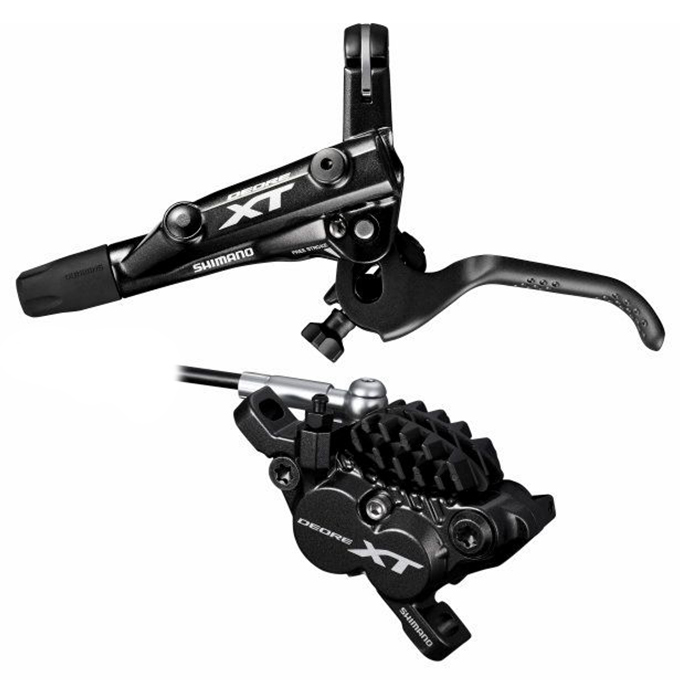 The M8020 XT with 4-Pot caliper disc brake offers high performance stopping power for aggressive trail, enduro and e-bike riders. Forged alloy brake lever for optimum strength and reliability. Uses non-corrosive mineral oil brake fluid. Shim-less mounting system allows for quick setting up. Brake lever reach and free stroke adjustment. Replaced a set of Guide R's with these most recently. I've got multiple sets of Shimano brakes and the interchangeability of levers, hoses etc is a bonus. The major reasons for the upgrade are much better braking performance in my opinion and a far more user friendly bleed process as well as a much milder hydraulic oil. Can't fault them, phenomenal stopping power. Just completed the install on these on a 2018 Turbo Levo Carbon Comp. Added Shimano adapters and 208mm Ice Shimano Rotors and this is an easy to setup system. Everything needed to resize the cables included. If you pick up the Shimano bleed funnel and some Shimano hydraulic mineral oil you have what you need to make it work. I won't be able to ride these until spring but they bench check good and look fantastic. Best price I could find on these in the world was here at Merlin and shipping to California took about 9 days including a bit of weather delay. Absolutely loving these brakes over the SRAM Level T's that I upgraded from. Incredible stopping power and feel. The kit arrived plumbed to suit Australian RHS front brake and the rear disconnected so it could be run internally. This kit came with the Shimano easy hose joint system on the rear which made plumbing it up a piece of cake. Didn't even need bleeding. Great brakes and extremely easy to set up. I got a mechanic to install the rear brake simply because it was internal routing and I couldn't be bothered. Easy install and awesome brakes. Brakes arrived on time and were very easy to fit, in my opinion they work better than the SRAM Guide R brakes they replaced. These brakes feel excellent. Superb price for the combination of front and rear, saving a decent amount from buying individually. As you may know, the brakes are easy to install and bleed if required. Took a while to locate the olive for the rear brake, tucked away inside the lever! Customer Support were very helpful in pointing me in the right direction though! Excellent brakes a full kit, ready to fit. Rear Brake is not assembled with olive supplied loose so pipe can be internally routed. Note if hoses are too long you will need to purchase olive and pipe adaptor + assembly tool.. This was not a problem with such a good price for a set, I purchased 2 sets extra bits required cost me about £12 to fit 2 sets.